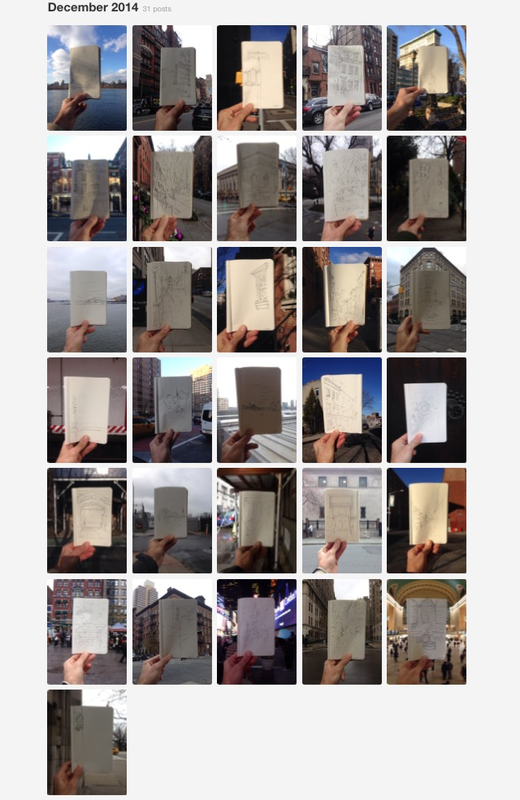 Did you know that in 2014 I made a drawing each and every day? Check out my Nick’s Lunchbox Service project, and often as it continues into 2015. The drawings are all made onsite, generally outdoors, photographed on site to blend in with the surroundings, and mostly focused on NYC streets and architecture, but occurred wherever I happened to be–with whatever time frame. Manhattan and Brooklyn are represented most frequently , but the project follows my travels to Buffalo and Columbus, and even to Toronto and to Turkey. Some days I would have one minute to make a sketch and others more time up to twenty minutes (and good weather, icy weather means a quicker sketch). In addition to the drawings, text went with it. Sometimes researched, sometimes a momentary impression. In the feedback I received, there were two main threads of a similar theme. One taking inspiration from the fact that “it doesn’t have to be perfect”. The other appreciating that a drawing is made every day I matter if I’m “too busy”. One post received over 20,000 notes in Tumblr, go figure. In 2015 I’m moving the “home” of the project from Tumblr to Instagram. I’m announcing you can commission a “lunchbox” drawing and photograph. Also, I’d love to make a book of this project — stay tuned. And if you were following along all year, thank you!